Katherine Wells, 2019 National Heritage Award for Lifetime Achievement! In 2007, the significance of the concentration of images on her land prompted Katherine to donate 156 of the acres she owned to The Archaeological Conservancy for their perpetual protection. This donation became the Wells Petroglyph Preserve. Katherine's amazing stewardship of her small part of Mesa Prieta was rewarded by the American Rock Art Research Association: in 2005 she was presented with their Conservation and Preservation Award. And in 2014, she received the Richard Bice Award from the Archaeological Society of New Mexico for Archaeological Achievement. is their first exposure to images their ancestors may have made hundreds of years ago. from the American Rock Art Research Association. 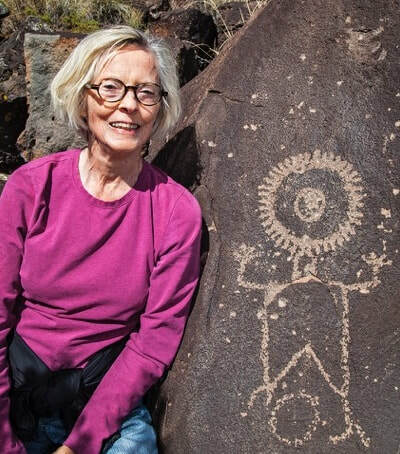 Katherine’s preservation efforts began to extend well beyond the confines of the Wells Petroglyph Preserve as she realized the huge archaeological heritage existing on the entire mesa. Under her leadership, MPPP has expanded dramatically. Today, some 100 volunteers work with various aspects of the Project. Some 100 public, private and school tours on the Wells Petroglyph Preserve are led by trained docents, frequently by Katherine herself. Over 1000 people a year participate in tours including interested locals and tourists who learn about the importance of this vast cultural legacy to the State of New Mexico. Management Section at the Laboratory of Anthropology in Santa Fe. In addition, digital data are uploaded to professionally managed servers across the nation. artifacts. Euro-American images include WPA glyphs and peace signs from the 1960s. Today, Katherine remains invested in all aspects of the Project. She particularly enjoys interacting with area youth in the two educational programs. Her efforts now primarily focus on gaining financial stability for the Project so that it may continue long into the uture. All of the 20 years Katherine has contributed to the Project have been as an amazing, generous, dedicated, hard working volunteer. Founder, Guardian, Visionary: Katherine Wells truly is all of these and more.